As the saying goes… better late than never! Here it is Saturday and it is only now that I have been able to choose the “right” sentiment for my Mojo Monday card for this week. Or as a good friend has now rechristened it, Mojito Monday – no guessing why we’re friends huh? Lol! Here is my card using one of the Moonlight DSP’s as my base and my feature. 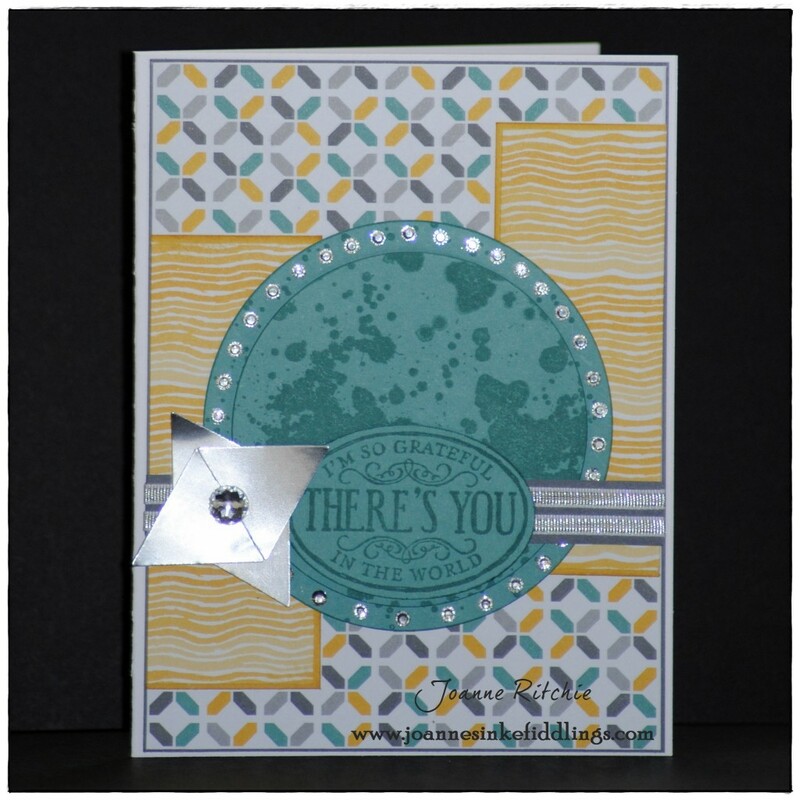 The base with a thin border of Smoky Slate Cardstock and the side pieces with a thin border of 2014-2016 In-Color Hello Honey Cardstock. The center circles and sentiment are all with the new 2014-2016 In-Color Lost Lagoon, noice! And this is this week’s Mojo Sketch 350. The new 2014-2016 In-Color Lost Lagoon worked brilliantly with these colors but looked a little bland against the patterns of the base. 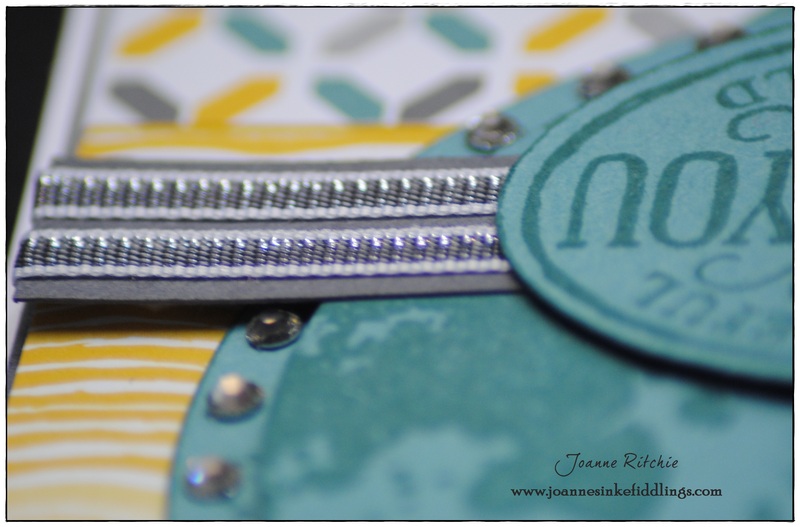 With the help of a little bling in the form of the small Basic Rhinestone Jewels to create a border (oh how I love those borders), a stamp from the Gorgeous Grunge Stamp Set, and some Silver 1/8″ Ribbon, all that was changed! Trying to come up with an embellishment other than a flower did have me thinking for more than a few moments but the Triangle Punch, a carry-over from the Everyday Occasions Catty, quickly solved THAT problem. 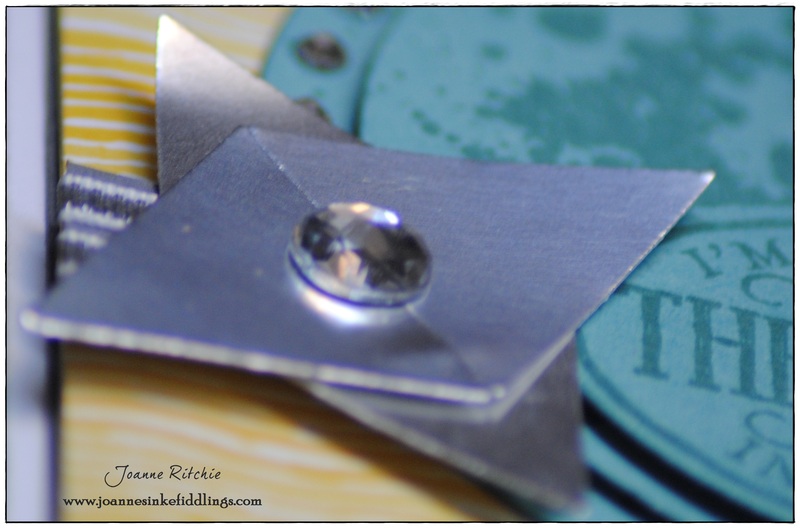 Two triangles placed at right-angles on top of two others created a wonderful “space-like” embellishment. « Project Life makes it EASY!